Members of the American Holistic Veterinary Medical Association have been giving Myristin® to horses, dogs, cats, and other animals, since 1996. Myristin® Equine Hip & Joint Formula was developed for horse owners and caretakers who were seeking a supplement that specializes in Cetyl Myristoleate (CMO). There are many equine joint formulations on the market, some of which contain various amounts of CMO. However, those other formulations contain more of other joint nutrients (such as glucosamine, MSM, and vitamins) than they do of CMO. 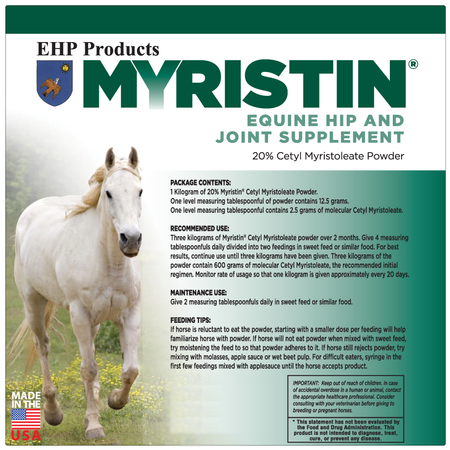 EHP Product’s Myristin® Equine Hip & Joint Formula omits the other joint nutrients, leaving a robust dosage of Cetyl Myristoleate (20% of the product) in a corn starch base. Customers often ask how Myristin® Equine Hip & Joint Formula compares with other Cetyl Myristoleate (CMO) joint products on the market, mainly for price comparison. Our experience is that competitors’ labels and marketing information often do not reveal the true amount of molecular CMO in their products. When comparing the cost of molecular CMO in our product to the cost of actual molecular CMO in our competitors’ products, Myristin® Equine Hip & Joint Formula offers the best value – by far. How much should I give to my horse? We recommend an initial 60-day regimen of 4 measuring tablespoonfuls of Myristin® Equine Hip & Joint Formula powder per day. By the end of the 60 days, your horse will have taken 600 grams of molecular Cetyl Myristoleate. The powder is mixed in with any kind of sweet feed, oats, etc. 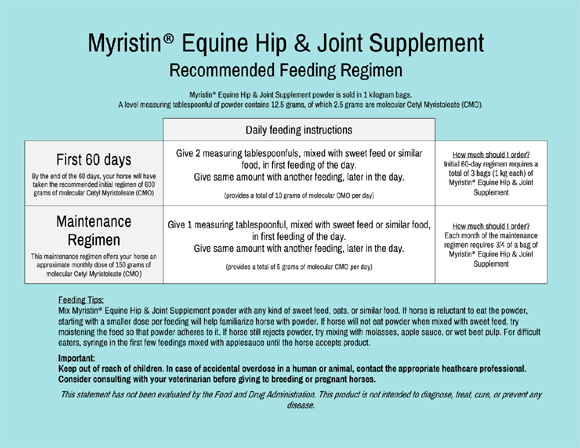 After the initial 60-day regimen, we recommend a maintenance regimen of 2 measuring tablespoonfuls of Myristin® Equine Hip & Joint Formula per day. This maintenance regimen offers your horse a monthly dose of 150 grams of molecular Cetyl Myristoleate. For complete feeding instructions, please see our recommended use sheet below.